Are you looking for something fun to do with your kids? I have just the idea! This summer, after the Free Lunch Program, we did a series of activities based on the Magic Tree House book series by Mary Pope Osborne. One week, the book of the week was “Twister on Tuesday”. That means that everything was weather related. We did crafts and weather journals and had all kinds of fun, but we were looking for something else to spice it up. 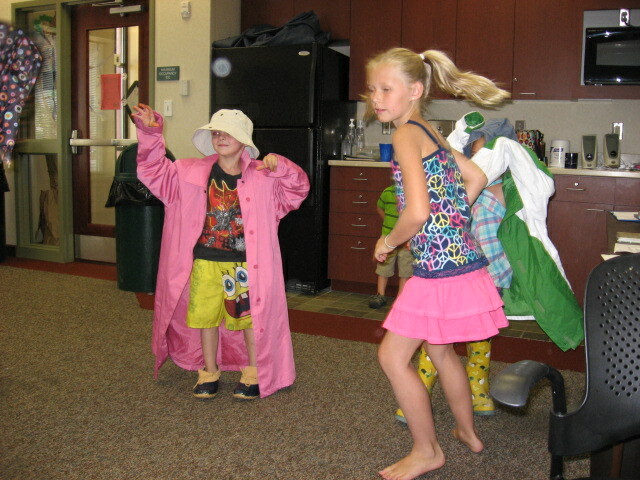 Then we came up with a Weather Relay game. The kids were broken into 2 groups, playground pick style; each group had 1 child on one end and the rest of the group on the other end of the room. Each child in line had to take a piece of clothing to the one person on the other end. That person had to put the clothing on before another piece could be brought to them. The child who brought the clothing to them could help them if they needed it. They ended with an umbrella that they had to deploy to finish the relay. 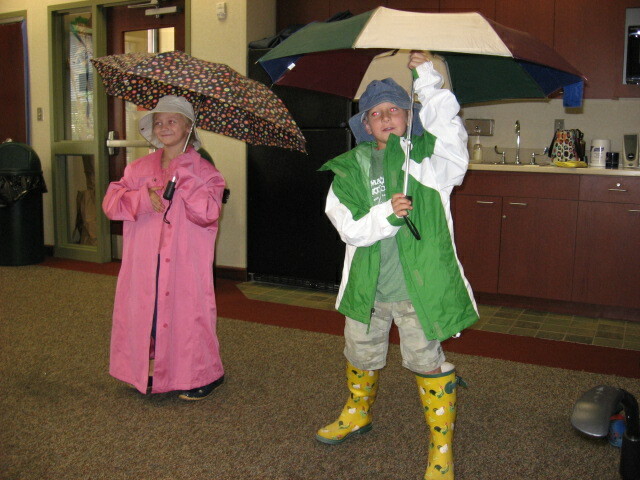 We had rain jackets, hats, and rubber boots/shoes. The one thing I would recommend is that you use the kind of umbrella where you push the button to deploy it rather than the kind you have to open manually. The kids found the push button easier to use. We ended up having a wide age range of kids. However, the older kids helped the younger kids and they all made it work. The best part was that the kids LOVED it and it didn’t matter who won or lost. They had so much fun doing the relay game that we did it twice that week. Every child had the opportunity to be the “it” person and put on the clothing. If there weren’t enough kids, we had staff that filled in. It was extremely fun and I think we are going to try it again sometime. Our guest blogger today is Kate Vinz. Kate is the Children’s Librarian at the Little Turtle branch of the Allen County Public Library system.